This powerful self-propelled lawn mower features a wide range of cutting heights appropriate for most lawns. This model is hard to push uphill due to its considerable weight. This is a gas lawn mower with a powerful and, yet, fuel-saving engine. This model is easy and simple to use, and it is a great choice for average-sized and large lawns. Electric starter ensures an easy and fast start. Tri-cut cutting system provides the high-quality mowing. The wheels may skid when the mower moves too fast. It is a handy lawn mower remarkable for its low-noise engine. Thus, this model will be perfect for small lawns in bedroom communities. Easy cutting height adjustment. Quiet engine consumes the fuel expediently. This model comes without collection bag, so you have to rake up the grass by hands. This is a good lawn mower for an affordable price. This model is able to trim small areas and can be successively used on hilly grounds. The powerful engine easily copes with thick grass. The height of each wheel can be adjusted so as to mow rough surfaces. Small cutting height, no engine speed adjustment. This simple and compact gas lawn mower will be great for small-sized areas. It works quietly and efficiently thanks to Honda GVC160 engine. Big grass collection bag lets you work for a long time. The engine starts instantly and smoothly, so starting the mower is easy. The medium-power engine is not good for big lawns. 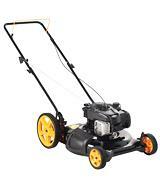 This gas lawn mower will be appropriate for small yards owing to a medium power. However, it will cope with any bumps on the lawn due to big wheels. Honda GCV160 is rightly regarded as a powerful and convenient lawn mower that is suitable for medium-sized and large lawns up to 1/2 acre. This model comes with a gasoline-powered engine with the displacement of 9.8 cu in and power of 2.9 kW, and is able to develop speed up to 4 mph. The engine is distinguished by its high reliability, economy, and relatively quiet operation. This mower will be a perfect choice for any country house. 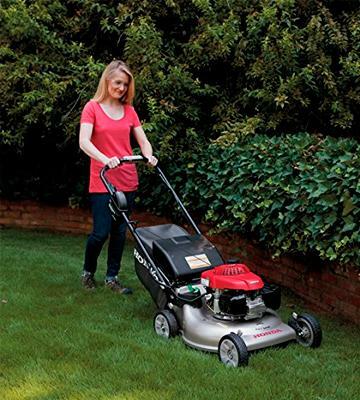 This gas lawn mower features the Twin Blade system that provides effective mowing without leaving gaps. 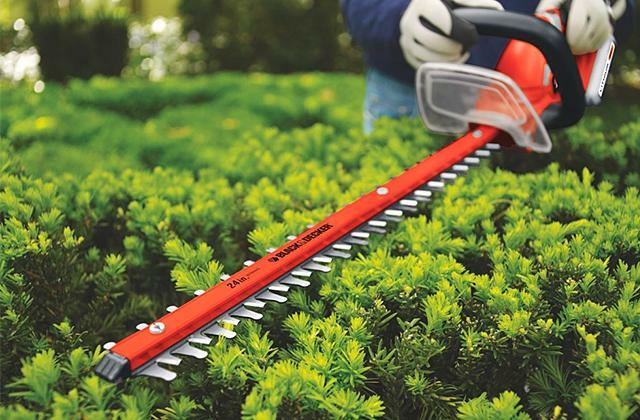 The cutting width is 21" and it allows you to cover a big area of lawn, saving your time. The cutting height can be adjusted to 6 positions within the range from 1.1" to 4" with no tools. This lawn mower combines three functions: mulching, bagging, and side discharge. And you can easily choose the necessary mode right during the mowing. Probably, everyone wants to roll mower effortlessly, in particular, uphill. Honda GCV160 will provide you with such an opportunity as it propels itself and you just need to guide it. The usability starts from the easy run as Auto Choke System provides quick starting the mower. Honda GCV160 is equipped with a handle that can be folded up for comfortable storage. Moreover, the handle height can be adjusted to 2 positions. The blade control lever is arranged on the handle for convenient handling the mower. 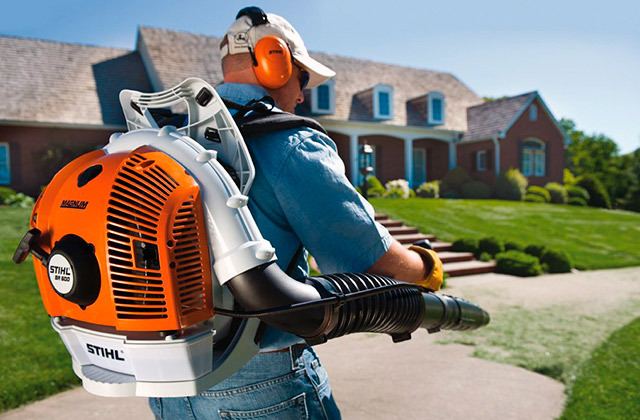 Lawn-Boy 10734 comes with Kohler® XT6 engine boasting the displacement of 9 cu in and power of 2.4 kW. This engine will let you easily trim medium lawns with areas up to 1/4 acre, yet this mower is able to cope with 1/2 acre of lawn as well. The only thing you need to mind is that the engine gets hot when you work a lot, and you should let it cool down periodically. It should be noted that the blades draw the grass poorly when the mower runs fast, so don't hurry and your lawn will look excellent. The lightweight and durable 21" steel deck and Tri-Cut Cutting System of this lawn mower provide exceptional cutting quality and thorough mulching. 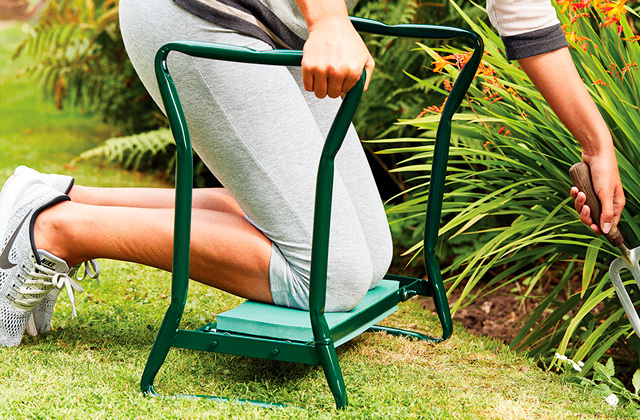 In addition, the cutting height can be adjusted to 6 positions from 1.25" to 3.75", so you can always set the needed position for your lawn. Like most models, Lawn-Boy 10734 works according to 3 modes: it mulches, collects the grass into the bag, and discharges it aside. Like the previous model, Lawn-Boy 10734 features the rear drive wheels which will let you use the mower with minimum efforts. The electric start system is the main distinguishing feature of this mower. This system makes starting much easier as compared with pull starting. Changing the cutting height and detaching the grass collection bag are easy and you can do this all without any tools, which is very convenient. Poulan Pro PR500N21SH is the medium-power lawn mower equipped with reliable Briggs & Stratton 2 kW engine of 8.5 cu in displacement. This engine consumes less fuel thanks to its small power, so it is one of the most economical engines. Moreover, it gets hot more slowly than other powerful models do. Therefore, you can work longer and make less breaks. This mower will be perfect for mowing small lawns of up to 1/7 acre. 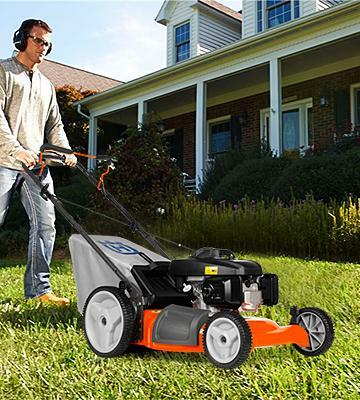 This gas push mower is equipped with 21" blade that easily copes with grass up to 4" high. The cutting height is variable and can be set to 5 positions from 1.2" to 3.54". The adjustment of the cutting height is easy thanks to 4 height adjusters on each wheel. This push mower is remarkable for the absence of collection bag. So, it becomes self-evident that grass is discharged directly on the ground. Such a design makes Poulan Pro 961120131t light and compact. Poulan Pro has no drive wheels, though it is compensated by the light weight of the entire structure. So, you will be able to maneuver this mower on meandering and hilly lands or around shrubs and trees. The lightness is contributed by the absence of grass collection bag that may be purchased additionally. The quiet medium-power gasoline engine will let you mow the grass any time without bothering your neighbors. Husqvarna 7021P is equipped with a rather quiet and fuel-saving 6.9-gross-torque Honda GCV160 engine with the power of 2.9 kW and cylinder displacement of 9.8 cu in. The engine speed reaches 3000 rpm, so the cutting blades rotate fast and draw all the clippings very effectively. The capacity of the fuel tank is 0.9 l that is enough to process a medium-size lawn of the area up to 1/3 acre without refilling. 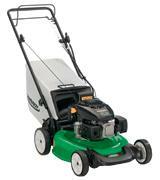 This gas push mower with a bag is provided with a 21" blade for high-quality and quick cutting. 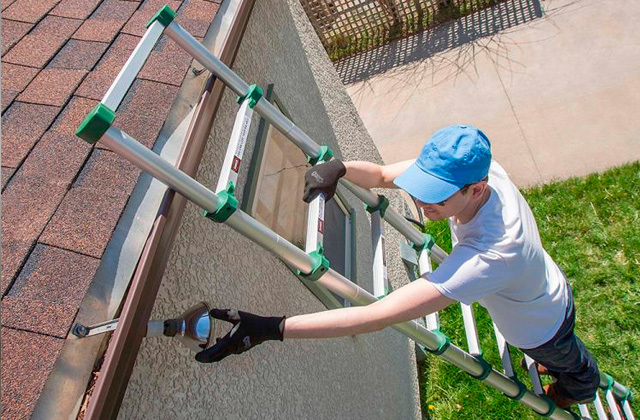 The cutting height can be adjusted from 1.5" to 3" and can be fixed to 5 positions. 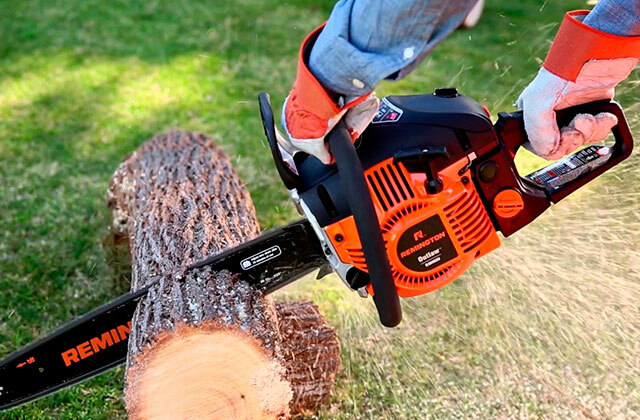 Like other models represented in our review, Husqvarna 7021P is able to work in three modes: mulching, grass collection into a 1.7-bushel catcher, and side discharge. You can easily switch this mower to discharging by detaching the catcher and closing the rear door. The powerful engine will allow easy cutting of thick and high grass. This gas push mower comes without drive wheels, hence, you have to push it by hands. Nevertheless, the mower is easy to guide. 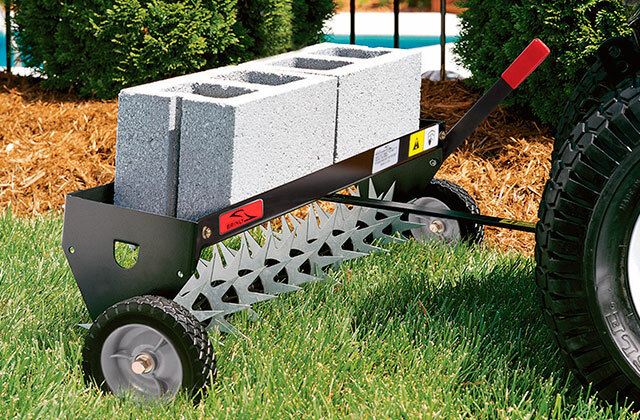 The height of each wheel can be adjusted to set the desired length of grass in your yard. This process may be somewhat complicated, still, it will be very helpful when you need to mow the grass on a bumpy ground. 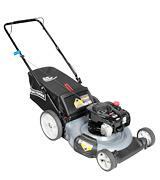 Craftsman 37430 comes with reliable Briggs & Stratton engine with the power of 2 kW and the displacement of 8.5 cu in. This engine is not the most powerful, but it consumes fuel sparingly and works quietly. This gas push mower will be great for country mansions with lawns up to 1/3 acre. As soon as you get this efficient and reliable gas push mower with a bag, you will be definitely satisfied with its great performance. Like other models presented in our review, this lawn mower is equipped with the blade which is 21" long. The Precision Plus™ cutting system provides high-performance bagging and mulching of thick grass. The dual-point deck height adjusters will let you effortlessly set the cutting height to 6 positions from 1.25" to 3.75". The cutting modes include mulching, grass collection into the rear 2.3-bushel bag, and side discharge. This gas lawn mower is non-self-propelled and is easy to handle. The Smooth Start™ recoil starter will provide a quick start of the engine. EZ Empty rear bagger ensures easy detachment and complete filling of the bag with grass chippings. Dust Blocker™ protects the gear from penetration of dust. The 11" rear wheels facilitate rolling of the mower over all types of terrain. Finally, the handle can be folded up for compact storage in places with too small space. Each house owner wants to have a good-looking lawn in his/her yard. A lawn mower is ready to help. Some models are designed to trim grass, while others are able to fertilize ground as well. 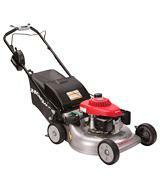 Gas lawn mowers with internal combustion engines refer to such models. They are notable for self-sufficiency and wide working range: they don't need a connection to power supply, and their power is enough to process big areas. 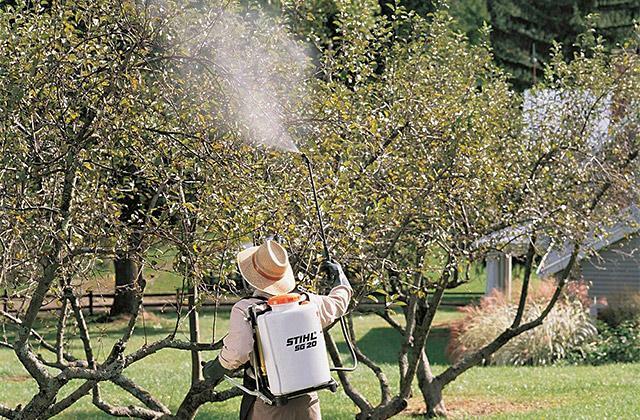 Thus, they have gained wide popularity and become irreplaceable assistants in gardening. 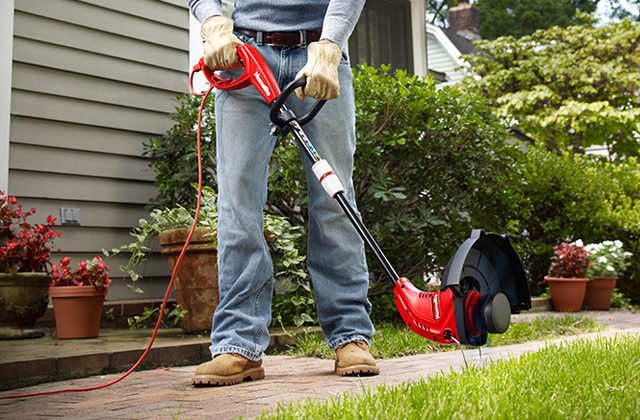 If you have green hedges and shrubs in your yard, you should pay attention to gas string trimmers and hedge trimmers. 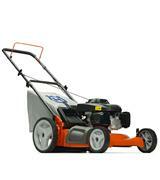 The performance of gas lawn mowers depends on the engine power. The more powerful engine is, the faster the blades rotate, drawing the mown grass. You should make your choice based on the area of your yard. 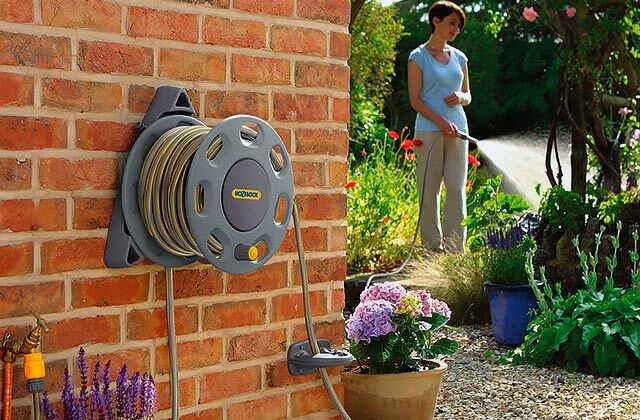 For example, a model with the engine up to 2kW is enough for a lawn of up to 1/7 acre. 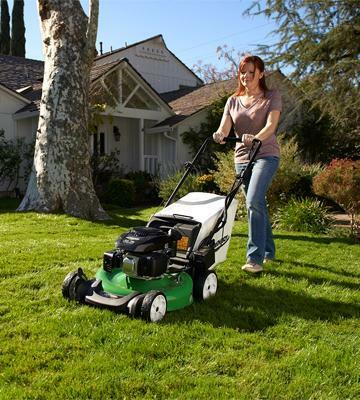 If you have a yard of 1/4-1/3 acre, you will need a lawn mower with the power up to 2.5kW. Lastly, if you possess a lawn of 1/3-1/2 acre, you should pay attention to the models of 3kW and more. The efficiency of mowing is influenced by several parameters such as a number of blades, width, and cutting height. 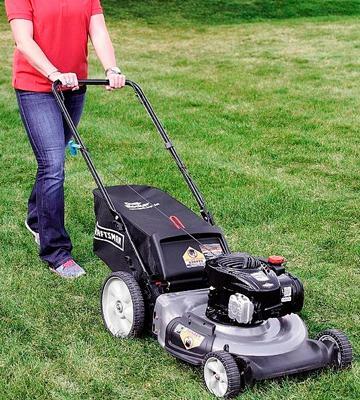 A gas lawn mower usually features two blades, but there are models with one dual blade. Such a design is needed for fine grinding that is also called mulching. If we consider the cutting width, most lawn mowers have cutting decks from 13” to 17”, while professional models feature the cutting path from 17” to 21.5”. 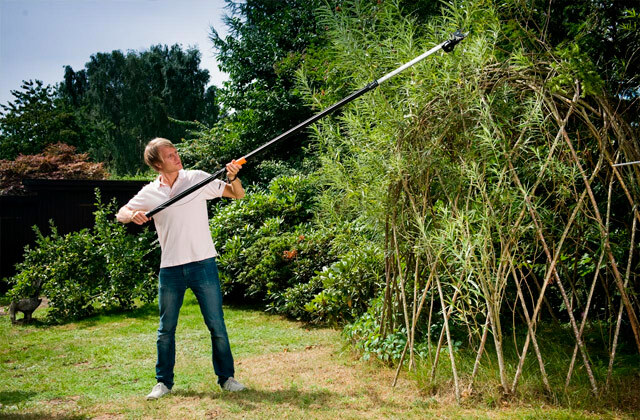 The wider the blade is, the more grass it can grab per a single sweep. Concerning the cutting height, it can be also adjusted from 1.2” to 4”. 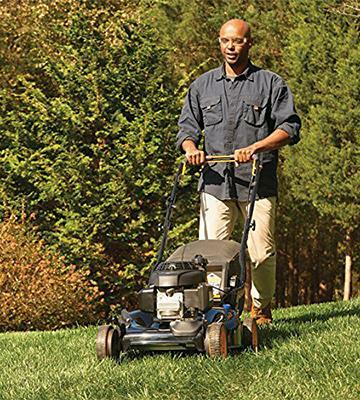 Every lawn mower features several cutting modes: mulching, bagging, and discharge. Bagging and discharge are clear, yet mulching should be more to tell about. 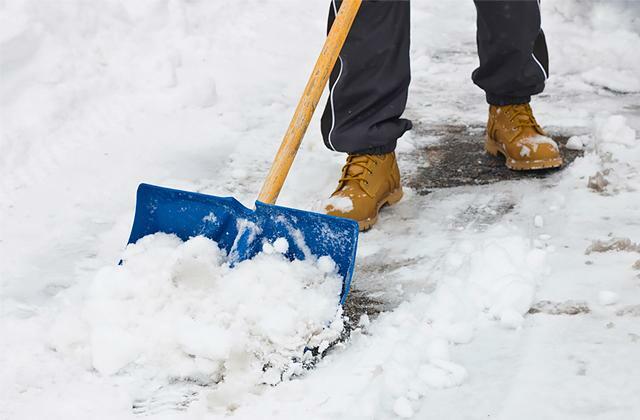 Mulching means the grinding of grass until a formation of mulch to be dropped on the ground. In such a way, mulch forms a special layer that protects the lawn from vermin, weeds, retaining the damp. The mulch decomposes and, thereby, serves as organic fertilizer for the ground. There is no doubt that a lawn mower should be powerful and efficient, however, it should be usable as well. The drive wheels are the main peculiarity in this regard. When a lawn mower propels itself and you just guide it in a needed direction, it is easy and nice to use, in particular if the ground is hilly. On the other hand, if you have a lot of trees or sharp turns in your yard, it is better to use a non-self-propelled model. The usability may also include the availability of a bag or a catcher for grass collection since some models come without this equipment and you need to pick grass by yourself. The size also plays quite an important role. Some lawn mowers are equipped with folding handles providing convenience in storage. And, of course, you should pay attention to the engine. The engines of all gas lawn mowers are the same in maintenance; they should be washed, and oil should be replaced each 50 hours. But, the advantage is apparent – the mower does not depend on a power supply and the working range is unlimited. Sums it up!